From 1979-1992 the Conservative government stood strong winning three consecutive elections under Thatcher and a fourth under John Major. The Labour party struggled to combat their majority and only toward the latter part of the eighties, under Neil Kinnock, did it begin to increase in popularity. Work from scholars such as Dennis Kavanagh, David Rubinstein, and Steven Fielding has attempted to chart the development of the Labour party from its most radical in 1979-83 to the New Labour of 1997. This modernisation has been seen by many to signal a move away from Labour’s core principles toward a new mix of Thatcherite and Liberal values. Within the current context of the Labour leadership election, this text looks at the way the party changed from the Labour of Michael Foot at the beginning of the eighties to Blair’s New Labour in the early 1990s, which eventually gained electoral success. After the loss of government to Margaret Thatcher’s Conservative Party in 1979 the Labour party experienced an internal battle that would continue for the duration of the decade and beyond in an attempt to regain popular support. From 1979-1983 Labour was led by Michael Foot who led a shift to a ‘New Left’ in the party of that period. The Mass Observation Archive is a useful resource when looking at this period of politics. It began to collect public responses after 1981, specifically asking respondents to comment on the General Election campaigns throughout the 1980s. In 1983 the majority of responses express worries about a weak leadership with an inability to deal with the more extreme left wing elements of the party. This links directly to the splintering problems Foot was experiencing under his leadership. The first of the challenges was experienced in the battle for deputy leadership between Denis Healey and Tony Benn. Benn, representing the ‘hard left’ of the Labour party, felt that the Labour defeat of 1979 had been a direct consequence of Labour’s failure to deliver strong socialist policies and sought an increased emphasis on the priority of nationalisation. However, against much opposition the deputy leadership was given to Healy, with Foot seeking a figure that could stand as a centre point to the party’s various left wing outlooks. Although Foot had taken measured steps in developing the party structure the event was seen as proof of a party under strain. Alongside this, the Trotskyite group Militant were accused of hijacking the Labour party in the aim of establishing a socialist takeover, placing further strains on the party. By the early eighties they had significantly increased their membership and established control of Liverpool City Council. Working independently to the central government initiatives, they perpetuated a growing perception of Labour as a non-democratic party, with extreme socialist tendencies, unrepresentative of a British public who had never expressed a desire for revolutionary socialist change. The implementation of electoral colleges to select Labour representatives and the high level of trade union representation on the National Executive Committee also encouraged the feeling of a party that was not representative of the majority of the British public. The press portrayed Foot as indecisive in dealing with his party’s problems, as it had done with the leadership battle, presenting him as a bumbling figure in contrast to Margaret Thatcher’s increasingly dogmatic approach. However, as Niklaus Thomas-Symonds points out in his analysis of Labour’s leadership, Foot was in fact negotiating with increasingly delicate relationships within Labour to prevent further loss to the party without a strong backing in decisions. Thatcher’s strength of leadership was in contrast further increased by her decisive action on the Falklands defence against Argentina. These events fed into a national perception of Labour as a party that was ‘disorganised and ramshackle’. This was exasperated further still by the formation of the Social Democratic Party in 1981. Foot was very critical of the SDP, accusing them of ‘siphoning’ Labour support and enabling the Tories to win more seats, something supported by the 1983 election figures. The strong right wing policies of Thatcher’s government had accentuated the Leftist policies of the Labour cabinet and the SDP had developed in response to an increased support for a more centrist approach. The Socialism of Foot’s party was seen as out-dated and old fashioned in comparison with the free market capitalism pursued by Thatcher. This may have indicted a directional change for the Labour party to pursue in the future, however in 1983 the perception of far-left extremism in the party had led to a credibility gap between Labour and the Conservatives and to the election defeat of that year. With the appointment of Neil Kinnock as Labour leader in 1983 the party made some progress with electoral popularity. By 1986 Kinnock had completed the expulsion of Militant that was first initiated under Foot, and began to move away from the high tax policy of the previous Labour governments. This can be seen as a response to Thatcher’s implementation of a monetarist economic strategy in stark contrast to the Keynesian model supported by Labour which called for high tax and large public spending. The new Thatcherite model was appearing successful in contrast to the economic downturns under Labour. However despite a move toward centre politics from the previous ‘hard left’ policies, Mass Observation responses to the 1992 General Election still show a belief in the existence of ‘hidden left wingers’ waiting to take the leadership on election success perpetuated by highly visible party members such as Arthur Scargill and Ken Livingstone. Scargill’s involvement with the miners’ strike of 1984-1985 seemed to express a continued collusion with the trade unions. In comparison Thatcher’s strong handling of the trade unions had won her support from the public, who saw a reclamation of economic control from the unionists. Furthermore, ‘Red’ Ken Livingstone, who represented the Greater London Council from 1981-1986, was portrayed by the press as representing Labour’s ‘loony Left’ as a result of his high profile support for minority causes and multi-cultural initiatives. Throughout the Thatcher year’s minority representation had been pushed aside and a more xenophobic, nationalism encouraged causing Livingstone’s stance on such issues as gay and women’s rights to appear extreme in comparison. Livingstone defied Thatcher’s authority to the extent that she removed the GLC entirely leaving Labour’s representation within the London boroughs severely diminished. In addition to unpopular individuals within the party, the party leader was still unpopular, with many of the Mass Observation responses identifying Kinnock as the main reason for the loss of their vote. A Harris poll from the 1992 election campaign suggested that Labour would have gained a 10% lead over John Major if John Smith had taken over the leadership position. These perceptions of the party were exasperated by a national press backed in the majority by Conservatives supporters. The Sun Newspaper’s infamous front-page spreads surrounding the 1992 election demonstrated the extent of the aggressive media opposition to Labour. 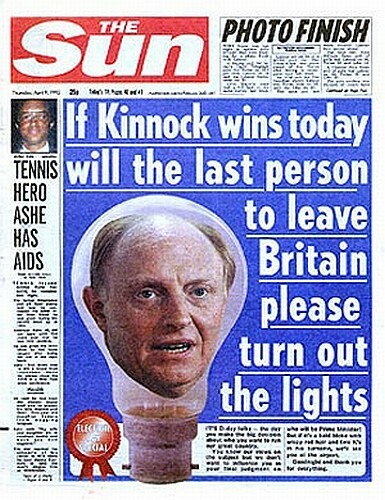 On the day of the election the ‘If Kinnock wins today will the last person to leave Britain please turn out the lights’ front page ridiculed Kinnock’s policies, and was followed on the 11 April, by a spread celebrating the paper’s contribution to the Conservative win. Tory media advisor, Maurice Saatchi peddled the notion of a Conservative party ‘cruel and efficient’ and Labour as ‘incompetent and caring’. In 1983 Kinnock set up the Campaign Strategy Committee headed by Peter Mandelson in order to improve media strategy, party political broadcasts, and opinion-poll research. The media had become increasingly important throughout the eighties with Margaret Thatcher grasping it with both hands. At the beginning of her leadership campaign she sought media training and a style makeover, marking a new adherence to media manipulation within the political sphere. Thatcher’s close relationship with America had also resulted in more presidential approach of electoral campaigns, and government focussed on her personality as election draw. However this approach still needed to be handled with care. Thatcher’s personality had been long admired by the British public, whereas this confidence was misplaced in the hands of Kinnock’s campaign of 1992. He appeared to have veered too far for much of the public and in many of the Mass Observation responses Kinnock is described as ‘cocky’. Throughout his leadership advances in the development of Labour’s strategy, Kinnock’s popularity never improved dramatically, mainly due to his perceived links to the Labour cabinets of old. By the end of the decade a further problem facing the party was the loss of Labour’s core working class vote. As a result of Thatcher’s aggressive closure of many areas of nationalised ‘working-class’ industry, there had been a steep decline of the working class vote from two-thirds of the electorate to less than half by the 1992. Instead a new administrative middle class voter had come to represent the majority of the electorate and had replaced permanent party supporters with a more fluid voting behaviour. Instead of familial or territorial loyalties, personal experience at the point of an election was more relevant, suggesting campaigns could gain a much more instant effect. These weaker political allegiances meant that it was increasingly important for parties to match the shifting mood of a larger pool of floating voters through presenting policies that could ‘catch-all’ areas of the electorate. The Labour party needed to rectify their perceived weak leadership with the development of a strong charismatic leader, and although this went some way with Neil Kinnock, it found its figure in Tony Blair. Labour increased the power given to the leader of the party, which can be seen as a general shift in politics after Thatcher whose own cabinet were subject to her determined decision making. With Blair and his team of ‘modernisers’ the Labour party moved from old-fashioned to modern and from middle-aged to young and exciting. Their vibrant, managerial style, promoted under Mandelson, appeared to represent a sharp break with the past party, instead appearing ‘organised and professional’. The new leadership under Blair, from 1994 onwards, now had the confidence and sway to make dramatic changes to the party’s program. The 1997 Labour manifesto stressed the break from trade unionism, the new membership scheme, and changes to Clause IV of the constitution. The party was open about the influence that the Thatcher government had had on their policies, and were in fact forthcoming with their acceptance of Conservative influence. New Labour set to work changing what were seen as their outdated power structures and organisation. They altered their base of financial support, away from trade union membership fees toward individual investment and reduced the trade union presence within the NEC. In addition they moved away from the use of the electoral colleges in choosing Labour leadership, instead opening the leadership vote to the whole of the party membership. Probably the most dramatic change to Labour under Blair, and the one, which is thought to most represent New Labour’s break with its core values, is the revision of Clause IV. Clause IV was the part of the Labour Constitution which defined its socialist basis calling for the ‘common distribution of the means of production, distribution and exchange’. Blair rewrote the clause removing any element of common ownership and replaced it instead with the notion of equal opportunity and individual potential. This can be seen as an attempt by New Labour to move away from the socialist ‘extremism’ attached to the Labour of the early party that they felt had caused a rift between the Labour and electorate. However this was not the first time that the clause had been under revision. Hugh Gaitskell, Labour leader between 1955 and 1963, had called change under his but was met with fierce opposition from the more left wing members of the party. Aneurin Bevan, his Deputy, highly criticised the proposals claiming that with the revision of Clause IV there would not be much to differ between Tories and Labour. In this respect New Labour can be seen as a return to Gaitskell’s revisionism rather than a new form of the Labour party entirely. Blair had also grown up politically under the tutelage of Roy Jenkins, who had led the formation of the SDP, perhaps influencing a more liberal approach to the economy. The changes were presented as vital adaptations to the irreversible societal changes brought about by the Thatcher government. Since 1979 privatisation had proved popular, whereas in the past Labour had attacked the Tories’ individualism and capitalist agenda as archaic, New Labour was now forced to accept that privatisation was the modern way. New Labour’s Third Way, presented a capitalist economic structure mixed with some light left wing social policy. Now the Labour party didn’t want to abolish capitalist structure, just stop the worst excesses of it. The change to Clause IV presented the public with a clean break from the party of the eighties and allowed voters to pursue Thatcherite policy with a caring edge. Many of these changes were in direct response to the government of Margaret Thatcher throughout the eighties. Thatcher had consciously used the media to court a strong public image. This was supported by the mass media’s Conservative ownership. As a result Labour had to employ glossy publicity material and a slicker more managerial image. Her reduction of state interference effected Labour’s policies on both economic and social issues. Thatcher distanced herself from minority political issues and instead encouraged a greater individualism and personal responsibility fro the British people. This was an area of policy where Labour maintained much of its foundation however, reduced the publicity given to such specific initiatives. Labour moved toward the promotion of equal opportunities as an extension of its social policy. Thatcher’s monetarist economy and reduction of tax levels forced the Labour party to adopt an economic policy that offered the same free market liberalism. Under Thatcher socialism became a dirty word and for many her reversal of the post-war socialist consensus can be seen as her greatest achievement. Although these shifts are charted within the UK they were part of a larger acceptance of liberal democracy in contrast to socialist tendencies throughout Europe at this time. The collapse of the Soviet Union in 1989 had removed any hope of an egalitarian revolution. With the removal of the socialist option all parties were left to serve the same economic policy and simply offer better management of the free market economy. New Labour presented a shift of all parties to the Right after Thatcherism and a new type of politics based on a general premise of liberal democracy and policy based on the importance of capitalist advance. Blair’s win represented a new post-Thatcherite Labour party based more on pragmatism than principle. Interestingly in light of Labour’s recent election defeats the party is re-evaluating its central ideological position in response to a perceived need to redefine its stance in opposition to renewed Conservative popularity and a New Labour backlash. Despite the success accorded to the ‘New Labour’ revisionism of the nineties, the future in fact may see a return to the more Left wing elements of Labour’s history. ‘The General Election, Spring 1983’, Mass Observation Archive, (University of Sussex, SxMOA2/11/1). ‘The General Election, May 1987’, Mass Observation Archive, (University of Sussex, SxMOA2/22/1). ‘The General Election, Spring 1992’, Mass Observation Archive, (University of Sussex, SxMOA2/36/4). ‘The New Hope for Britain’, British Labour Party Manifesto, (1983), http://www.politicsresources.net/area/uk/man.htm. [26.04.2010]. ‘Britain will win with Labour, British Labour Party Manifesto, (1987), http://www.politicsresources.net/area/uk/man.htm. [26.04.2010]. 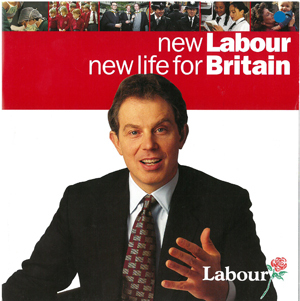 ‘New Labour: because Britain deserves better’, British Labour Party Manifesto, (1997), http://www.politicsresources.net/area/uk/man.htm. [26.04.2010]. Brown, G, ‘The Politics of Potential: A New Agenda for Labour’, Reinventing the Left, ed. by David Miliband, (Polity Press, Cambridge, 1994), pp. 113-122. Fielding, S, ‘New Labour & the Past’, Labour’s First Century, (Cambridge University Press, Cambridge, 2000), pp. 367-392. Fielding, S, The Labour Party: Continuity & Change in the making of ‘New’ Labour, (Palgrave MacMillan, Hampshire, 2003). Heffernan, R & M, Marqusee, Defeat from the Jaws of Victory: Inside Kinnock’s Labour Party, (Verso, London, 1992). Johnston, RJ & CJ Pattie, ‘People, Attitudes, Milieux and Votes: An Exploration of Voting at the 1983 British Election’, Transactions of the Institute of British Geographers, Vol. 13, No. 3, (Blackwell Publishers, Oxford, 1988), pp. 303-323. Jowell, R & S Witherspoon (eds. ), British Social Attitudes: The 1985 Report, (Gower Publishing Company Ltd, Hampshire, 1985). Kavanagh, D, ‘How We Vote Now’, Electoral Studies, Vol. 5, Issue 1, (Elsevier Science Ltd, London, April 1986), pp. 19-28. Kavanagh, D, ‘New Labour’, The Reordering of British Politics: Politics After Thatcher, (Oxford University Press, Oxford, 1997), pp. 216-237. Mandelson, P & R Liddle, The Blair Revolution: Can New Labour Deliver?, (Faber & Faber, London, 1996). Pimlott, B, ‘New Labour, New Era?’, Political Quarterly, Vol. 68, No.4, (Blackwell Publishers, Oxford, 1997), pp. 325-334. Plant, R, M, Beech & K, Hickson, (eds. ), The Struggle for Labour’s Soul: Understanding Labour’s political thought since 1945, (Routledge, London, 2004). Seldon, A & D Collins, Britain Under Thatcher, (Longman, London, 2000). Stewart, D, ‘The British Labour Party, ‘Parliamentary Socialism’ and Thatcherism, 1979-1990: A Visual Perspective’, Visual Resources, Vol. 24, Issue 2, (Routledge, London, June 2008), pp. 173-187. Thomas-Symonds, N, ‘A Reinterpretation of Michael Foot’s Handling of the Militant Tendency’, Contemporary British History, Vol. 19, No. 1, (Routledge, London, Spring 2005), pp. 27-51. Thompson, W, The Long Death of British Labourism, (Pluto Press, London, 1993). Guardian Opinion Poll, http://www.guardian.co.uk/news/datablog/2009/oct/21/icm-poll-data-labour-conservatives, (7 May 2010). D. Kavanagh, ‘New Labour’, The Reordering of British Politics: Politics After Thatcher, (Oxford University Press, Oxford, 1997), p. 224. RM. Plant, Beech & K. Hickson, (eds. ), The Struggle for Labour’s Soul: Understanding Labour’s political thought since 1945, (Routledge, London, 2004), p. 25. C112, ‘The General Election, Spring 1983’, Mass Observation Archive, (University of Sussex, SxMOA2/11/1). D. Stewart, ‘The British Labour Party, ‘Parliamentary Socialism’ and Thatcherism, 1979–1990: A Visual Perspective’, Visual Resources, Vol. 24, Issue 2, (Routledge, London, June 2008), p. 176. W. Thompson, The Long Death of British Labourism, (Pluto Press, London, 1993), p. 121. N. Thomas-Symonds, ‘A Reinterpretation of Michael Foot’s Handling of the Militant Tendency’, Contemporary British History, Vol. 19, No. 1, (Routledge, London, Spring 2005), p. 32. D. Kavanagh, ‘How We Vote Now’, Electoral Studies, Vol. 5, Issue 1, (Elsevier Science Ltd, London, April 1986), p. 26. N. Thomas-Symonds, Contemporary British History, p. 30. D. Stewart, Visual Resources, p. 177. N. Thomas-Symonds, Contemporary British History, p. 35. A12, ‘The General Election, Spring 1983’, Mass Observation Archive. W. Thompson, The Long Death of British Labourism, p. 120. P. Mandelson, & R. Liddle, The Blair Revolution: Can New Labour Deliver?, (Faber & Faber, London, 1996), p. 212. N. Thomas-Symonds, Contemporary British History, pp. 30-31. A. Seldon & D. Collins, Britain Under Thatcher, (Longman, London, 2000), p. 21. W633, ‘The General Election, Spring 1992’, Mass Observation Archive, (University of Sussex, SxMOA2/36/4). R. Heffernan & M. Marqusee, Defeat from the Jaws of Victory: Inside Kinnock’s Labour Party, (Verso, London, 1992), p. 53. S112, ‘The General Election, May 1987’, Mass Observation Archive, (University of Sussex, SxMOA2/22/1). R. Heffernan & M. Marqusee, Defeat from the Jaws of Victory, p. 303. D. Stewart, Visual Resources, p. 175-177. P. Mandelson, & R. Liddle, The Blair Revolution: Can New Labour Deliver?, (Faber & Faber, London, 1996), p. 3. A. Seldon & D. Collins, Britain Under Thatcher, p. 30. S. Fielding, Labour’s First Century, p. 367. R. Jowell, & S. Witherspoon (eds. ), British Social Attitudes: The 1985 Report, (Gower Publishing Company Ltd, Hampshire, 1985), p. 7-8.
 RJ. Johnston & CJ. Pattie, ‘People, Attitudes, Milieux and Votes: An Exploration of Voting at the 1983 British Election’, Transactions of the Institute of British Geographers, Vol. 13, No. 3, (Blackwell Publishers, Oxford, 1988), p. 303-321.
 RJ. Johnston & CJ. Pattie, Transactions of the Institute of British Geographers, p. 303. S. Fielding, Labour’s First Century, p. 385. A. Seldon & D. Collins, Britain Under Thatcher, p.89. S. Fielding, The Labour Party: Continuity & Change in the making of ‘New’ Labour, (Palgrave MacMillan, Hampshire, 2003), p. 128. B. Pimlott, ‘New Labour, New Era?’, Political Quarterly, Vol. 68, No.4, (Blackwell Publishers, Oxford, 1997), p. 326. A2212, ‘The General Election, Spring 1992’, Mass Observation Archive, (University of Sussex, SxMOA2/36/4). D. Kavanagh, The Reordering of British Politics, p. 219. S. Fielding, The Labour Party: Continuity & Change in the making of ‘New’ Labour, (Palgrave MacMillan, Hampshire, 2003), p. 80. P. Mandelson, & R. Liddle, The Blair revolution, p. 212. D. Kavanagh, The Reordering of British Politics, p. 218. G. Brown, ‘The Politics of Potential: A New Agenda for Labour’, Reinventing the Left, ed. by D. Miliband, (Polity Press, Cambridge, 1994), p. 117. S. Fielding, Labour’s First Century, p. 381. S. Fielding, The Labour Party: Continuity & Change in the making of ‘New’ Labour, (Palgrave MacMillan, Hampshire, 2003), p. 4. S. Fielding, Labour’s First Century, p. 379. R. Plant, M. Beech & K. Hickson, (eds. ), The Struggle for Labour’s Soul Understanding Labour’s political thought since 1945, (Routledge, London, 2004), p. 81. B. Pimlott, Political Quarterly, p. 329. S. Fielding, The Labour Party, p. 79. D. Rubinstein, Political Quarterly, p. 340. A. Seldon & D. Collins, Britain Under Thatcher, p.80. S. Fielding, The Labour Party, p. 10. F. Fukuyama, ‘The End of History’, The End of History & The Last Man, (Avon Books, New York, 1993). D. Kavanagh, The Reordering of British Politics, p. 224. D. Kavanagh, The Reordering of British Politics, p. 230. S. Fielding, Labour’s First Century, p. 371.